The Party Wall Etc. Act 1996 deals with a variety of matters which may affect a construction project. If undertaking any excavation works within 3 or 6 metres of an adjoining property then it must be ensured that the appropriate steps are taken to show compliance with the Act. Similarly, if it is proposed that any existing structure should be cut into or amended in any way which may have an impact on a neighbour, then Party Wall notices may also be required. At Cockrams, we offer a full Party Wall surveying service and can assist with the preparation of Party Wall notices and Awards or act on your behalf as Adjoining Owners surveyor should any Party Wall works be proposed by your neighbour. 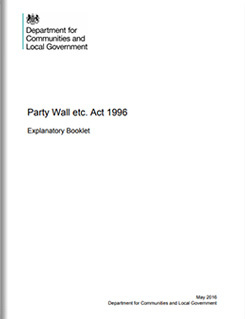 When considering Party Wall matters it is important to note that accuracy in the provision of information is key and can render notices invalid. It is therefore recommended that professional advice be obtained in relation to such matters. Please also note that the Building Owner (party responsible for carrying out works) is liable for the fees of the Party Wall surveyors on both sides.